A Betta fish should always be fed a diet that is high in protein. This carnivorous fish species thrives on aquatic worms and fallen insects in the wild. To meet a diet that your Betta would have access to in their natural habitat, you should offer a wide variety of food. If you cannot achieve a varied diet for your Betta, attempt to introduce one new food each week. Betta’s cannot survive purely on vegetables or plant roots. The bright, healthy coloration of a Betta fish is generally a direct result of a good, diverse diet. A Betta fish that is supplied a healthy diet is less likely to contract diseases in comparison to one that is fed poorly. Just like us humans, Bettas have specific nutritional needs that must be met to enable them to live a happy and healthy life. Betta fish need four main substances: vitamins, minerals, carbohydrates and proteins. Vitamins: These provide resilience to disease and prevent anaemia. These are commonly found in frozen and live Betta food. Minerals: Important substance to regulate fluid. Often found in formulated Betta pellets. Carbohydrates: Give your Betta fish energy and help prevent against disease. Carbohydrates need to be given in moderation as they have a constipating effect for Betta fish. Carbohydrates are found in a wide variety of fish food. Proteins: Provide energy for your fish and help build tissue/bones. The carnivorous traits of Betta mean they thrive off live foods that contain high amounts of protein. Food that is recommended for other fish species such as Goldfish is not suitable for Betta fish. The primary ingredient in any food you give your Betta should be protein. Secondly, providing fibrous food is important to help with your Betta’s digestion. Each day, your Betta fish should be receiving approximately 1.8 grams of food. When buying live food for your Betta, you are best to buy it from a reputable aquarium as they can carry both disease and parasites. It is important to understand that a Betta can live purely on live foods but cannot live purely on pellets. Betta fish love the challenge of hunting live food increasing their life experience. The benefit of frozen food is that it will keep until you are ready to use it. Any live food you purchase can be sectioned out and frozen for use at a later time. If possible, freeze-dried Betta food should be kept to a minimum. Although more cost efficient to owners, in comparison to live food, freeze-dried foods lack necessary vitamins. These types of food also lack moisture. Once placed in water they expand leading to constipation for your Betta fish. Dry food should not make up the majority of your Bettas diet. Dry food can often cause digestion problems and lead to more serious issues if excessive portions are consumed. 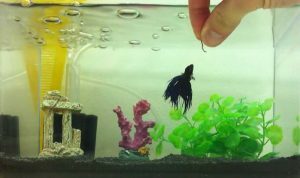 It is important to remember that the pellets you give your Betta will absorb water and increase in size. Always give dry food in moderation. Ensure the protein content of any dry food you intend to give your Betta is at least 40% of the overall ingredients. Pellets– Preferably soak pellets before giving them to your fish. This way the pellets are able to absorb water and be consumed at their actual size. If possible, try to avoid overfeeding dried pellets, flake or freeze-dried food. Some foods are marketed as “For Bettas” but could cause digestion problems due to indigestible fillers and low moisture content. You will usually find these in packages near where Bettas are sold. As with any betta fish food, do not overfeed and if you notice significant abdominal bloating, reduce the number of pellets fed or switch to live or frozen food. A Betta fry will feed off the yolk sack for up to 48 hours. After this time it will begin to look for food. Infusoria is a great source of food for your newly hatched Betta fry. Infusoria are minuscule aquatic creatures that are in liquid form. You may also like to feed fry microworms but keep in mind that anything you feed your fry must be tiny in size. How Much Do I Feed My Betta? It is often hard to know how much to feed a Betta fish. You don’t want to overfeed your fish but on the other hand you definitely don’t want to underfeed your Betta. Per feed, a Betta should be fed no more than the size of it’s eyeball. The size of your Betta’s eyeball, is approximately the size of it’s stomach. If you are feeding your fish bloodworms, three bloodworms per feed is adequate. The same goes for pellets. Three soaked pellets per feed is often enough for a Betta fish. Your Betta fish should be fed this serving twice daily equalling approximately 5-6 bloodworms/5-6 pellets a day. If you notice that all the food you are giving your Betta is not being consumed, reduce the amount per serve. Food that is left over to sit in the tank should be removed. Food left at the bottom of the tank attracts bacteria, contaminating the water. If your Betta eats all the food you are supplying think about increasing the portion size one blood worm/pellet at a time. 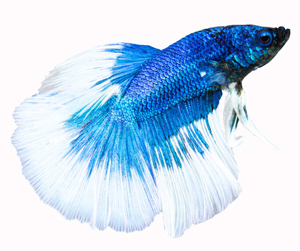 Owners often recommend never feeding your Betta fish more than what they can consume in two minutes. Surprisingly, Betta fish can become overweight from indulging in too much food. How Often Do I Feed My Betta? You should feed your Betta two times each day, evenly spaced out. Your Betta should be fed everyday although allow your Betta to fast for one day per week or fortnight. This decreases the risk of your Betta becoming constipated. Don’t fear, your Betta will not starve, in fact it would take your Betta two weeks to die of starvation. Feeding your Betta in the morning and night allows the food they have consumed to be digested before they have their next meal. Approximately twelve hours between meals is ideal. Feeding your Betta fish at the same time each day allows their bodies to get into a routine and reduces the risk of constipation. Tip: create a schedule of how much and how often you will feed your Betta. This will allow you to track how much food your Betta is consuming. Overfeeding your Betta can make them seriously ill. Overfeeding is linked to swim bladder disorder and constipation. Why Won’t My Betta Fish Eat? There are multiple reasons why a Betta fish may become uninterested in food for a period of time. Stress- If you have recently cleaned your Bettas tank or you are re-homing your Betta, food refusal for a few days is normal. Incorrect water temperatures- If the water in the tank is too cold, their metabolism will be slowed down. Age- Once your Betta ages, they become less active meaning they do not need as much energy from food. Illness- If your Betta is ill, they may not feel like eating. Ensure you monitor your fish and intervene if necessary. Fussy Eater- Just like us humans, some Bettas are fussy eaters. If your Betta isn’t fussed on a type of food, try an alternative. Harassment by other fish- Although Betta fish are a carnivorous species, they do not like to have to fight other fish for a feed. If you find that other tank mates are prohibiting your Betta from feeding, separate them for a period of time.